Airservices Aviation Rescue Fire Fighting Service (ARFFS) provides a range of services at 26 airports around Australia. ARFFS Services Aviation Fire Fighters are ready to respond to fires in aircraft and buildings at airports, provide rescue and first-aid services for aircraft passengers and crew, provide technical advice on fire safety and assist in educating users about fire fighting and safety. Our fire fighters have access to a fleet of modern, well equipped and maintained vehicles. When connected to our service, your facility is monitored by our fire fighters who will respond when a fire alarm is activated. For Adelaide, Brisbane, Cairns, Townsville, Darwin, Melbourne, Perth and Sydney airports this is a 24 hour, 7 days a week service. At other airports, fire alarms that occur out of operating hours will be still monitored by ARFFS with a response provided by the local fire services. Who monitors my fire alarm system? Airservices Aviation Rescue Fire Fighting Service (ARFFS) provides a range of services at 26 of Australia’s busiest airports. We are ready to respond to aircraft and building fires at airports and provide rescue and first-aid services for aircraft passengers and crew. Our fleet of fire vehicles are well equipped and maintained for effective and rapid emergency intervention. When connected to our service, your facility is protected by trained and well-equipped professional fire fighters. How does my fire alarm system work? Fire alarm systems can consist of a number of components including smoke detectors, heat detectors, manual call points, sprinkler systems and a signalling device. All parts of the detection system connect to the Fire Indicator Panel (FIP). In the event of a fire alarm, the FIP will sound an alert and indicate the location of the detector(s) that has activated. At the same time, the Alarm Signalling Equipment (ASE) pictured below, will automatically send a notification to the fire service. What standard must my system comply with? The Alarm Signalling Equipment (ASE) is connected to a fire alarm network which conforms to the Australian Standards for Fire Alarm Monitoring (AS4418.2 and AS1670.3). The ASE also complies with the requirement of AS4428.6, for Alarm Signalling Equipment. The Firemon System uses Romteck Alarm Signalling Equipment (ASE) to send fire alarm data from monitored premises to Airservices monitoring centres BN (Primary) and ML (Secondary). ASEs currently connect via a Telstra Next G wireless (primary) and a dial-up (secondary) connection to the Public Switched Telephone Network (PSTN). Note that both connections are required in order to meet the reliability requirements in Australian Standard AS 1670.3-2004. With the rollout of the National Broadband Network (NBN), Telstra is progressively decommissioning the PSTN. 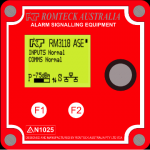 Romteck have developed a new ASE model that communicates using two Wireless communication interfaces to meet the AS1670.3 standard. What should I do if a fire alarm activates on my system? Building evacuation & fire plans including fire warden and extinguisher training processes are to be developed by managers and adopted by staff and occupants in the event of an emergency. In such an event, it is the responsibility of the owner/occupier to ensure that building evacuation plan is implemented. What should I do if there is a fault in my system? A fire detection system fault (fault) is usually caused by a problem with the electrical wiring or the failure of a detector or communications path. Unlike a fire alarm, and if the detection system is operating normally, a fault is not caused by smoke or heat. If your system has a fault, you may be issued with a fault/defect notice and/or contacted by ARFFS. In the event that your fire alarm system has a fault the FIP may emit an audible warning and display the words “fault” or similar. Contact your fire alarm service technician immediately. Note: ARFFS will not respond to a fault. How do I prevent accidental alarm activation when site work is conducted? Any work which may cause excessive dust and/or smoke. When you are expecting site work to be carried out which may cause unwanted alarms, an authorised person should isolate the ASE by either using the isolate key, or contacting your fire alarm service technician. You must also notify the fire station by telephone prior to isolating the ASE. Note, isolating the ASE will prevent the fire station from being able to monitor your fire alarm system. It is very important to ‘de-isolate’ the ASE once works have concluded to restore your fire alarm monitoring service. How do I reduce false alarms and faults in my system? There are a number of things you can do to reduce the amount of false alarms and faults occurring with your fire alarm system. Regular maintenance is very important and should be conducted by your fire service technician who is trained to maintain and record your system against the relevant Australian Standard. False alarms are often caused by activities carried out near detectors such as burning toast or building renovations/works. False alarms and faults can be reduced by changing location, type of detector or both. The sensitivity of detectors can deteriorate over time. The older the detector the greater the chance of a systems fault occurring. Contact your fire service technician for advice on detectors that are best suited. Reducing false alarms will save YOU and the fire service money, will reduce wasted efforts and may save lives. A fault compromises the effectiveness of your fire alarm system and, in some cases may incur a fine. Correctly operating fire alarm systems are an intrinsic part of preventing unnecessary loss of life within the community. This includes responsibility for not only the events occurring in a particular building, but additionally, responsibility for relative duty of care associated with managing events generated as a result of the fire alarm activation. A false alarm is defined as a fire alarm activation where the attending fire service finds no sign of fire at the relevant premises. False alarms initiated from fire alarm systems account for more than one third of all calls received by fire services throughout Australia. Many false alarms are due to a lack of maintenance and poor management of fire alarm systems. False alarms divert the fire service away from its primary role of preventing fires and attending real emergencies and impose significant cost through disruption to work and business continuity. Will I be charged for false alarms? False alarm charges are fines intended to encourage customers to maintain their fire alarm. Properly maintained fire alarm systems ensure the safety of occupants, property and the environment. Can I dispute a false alarm charge? If you receive a ‘Notice of Intention to Charge – False Alarm Callout’ and do not agree with the notice, you may contact Airservices in writing in accordance with the Chargeable False Alarm Guidelines. You must submit the False Alarm Charging Reversal Form within 15 business days of the date of the Notice. Airservices will make a determination based on the information provided within 10 business days of receiving the document. I have received an ‘Automatic Fire Alarm Fault / Defect Notice’. What should I do? An ‘Automatic Fire Alarm Fault / Defect Notice’ will be emailed or in some cases faxed by the fire station if a fault or defect has been detected in your fire alarm system. The section of your fire alarm equipment described in the notice may no longer be monitored by the ARFFS due to a fault / defect condition. Responsibility rests with the owner / occupier to rectify the fault / defect. Your fire alarm service technician may assist you with resolution. On rectification, the fire station must be notified by completing the relevant sections of the notice and returning to ARFFS.